The “All-on-Four” solution is attractive to patients wanting to get rid of their dentures, and to people with failing teeth in need of a full upper and/or lower restoration. This procedure, as the name implies, only requires four dental implants per jaw to support a fully customized set of replacement teeth. The entire “All-on-Four” treatment is completed while the patient is comfortably asleep using sedation dentistry, and the best part is that the procedure is painless and the patient receives their full set of replacement teeth in just 24 hours. Modern implant-based dentistry has provided a solution to the edentulous ‘toothless’ patient that traditional dentures have never been able to deliver – immediate functionality with substantially increased quality of life. 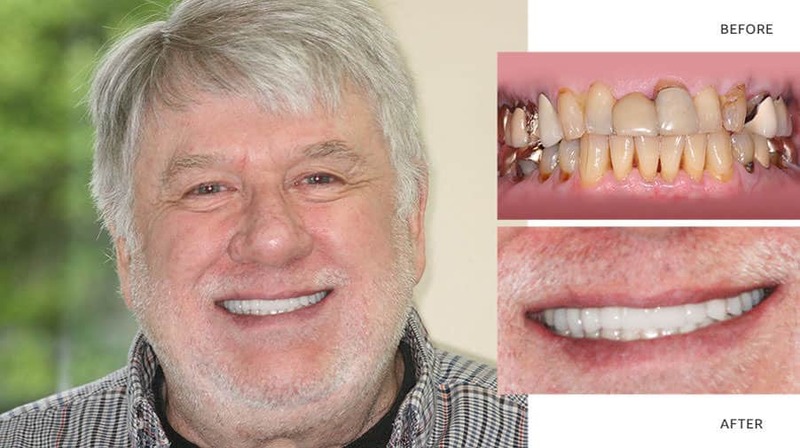 This is accomplished through a prosthesis held solidly in place by four dental implants (the “All-on-Four” Procedure) which not only provides the comfort and security a patient is likely to be missing with removable dentures, but as importantly also preserves bone in the jaw. In addition to receiving a fully customized set of replacement teeth in just one day. The “All-on-Four” procedure eliminates the day-to-day frustrations and discomforts of dentures, and patients can once again enjoy the dietary freedom of those with natural teeth. It is the most sophisticated solution there is to tooth loss. Traditional approaches to restoring a full arch of teeth usually involved bone grafts, six or more implants, and as many as 18 months of treatment. That meant that a patient often would be without any teeth or with ill-fitting temporary dentures for more than a year. With the All- on-four Dental Implant Procedure, the patient has one or two visits to our office to allow the cosmetic dentist to gather information for a treatment plan (e.g., CAT scan, X-rays, impressions, photos). Following this consultation, the patient is scheduled for surgery implantation and the new teeth are fitted and adjusted within 24 hours (even when extractions are necessary). The patient will return for occasional check-ups over the next several weeks and months. After almost six months, when the gums have fully healed and the implants are fused to the natural bone, we will take new impressions of the patient’s mouth and prepare a final, stronger, permanent set of teeth adjusted to a perfect fit. This helps ensure the longest life of the teeth, and provide maximum support, beauty, and function to the patient. At the practice of Dr. Kelley Fisher, we know you want your teeth looking beautiful and real. All of our All-on-Four cases are fabricated with premium Zirconia porcelain for optimal esthetics and unparalleled strength. As with all of our makeover cases, your teeth will only be secured in place after your personal approval and extreme satisfaction. Utilizing this approach, you will receive an extra level of confidence in making your new dream smile a reality.